Ohio Gov. John Kasich and Kansas Gov. Sam Brownback are both hard-right fiscal conservatives who have chosen to pursue the same path when it comes to cutting income tax rates that disproportionately benefit the wealthiest in each state. For Gov. Brownback, his Republican colleagues have had enough tax cutting for a while. After six years of cutting taxes and shrinking government, Republican legislators overrode Brownback’s veto of a bill that would undo some of the tax cuts he pushed. The state Senate and House moved swiftly, The New York Times wrote, voting only hours apart to turn back Brownback’s rejection of a tax increase aimed at raising about $1.2 billion over two years. Sound familiar? It should if you live in Ohio, where John Kasich has done the exact same thing, leaving the swing-state facing a nearly $1 billion budget shortfall as Ohio’s GOP-led legislature grapples with how to fill the void after Kasich’s income tax cutting that’s deprived the Buckeye State of more than $5 billion over the years has produced a series of monthly revenues that have fallen short of administration estimates that have already been scaled down, including in 10 out of the last 11 months. New reports show that Ohio’s tax revenues came in at $67 million, or 3.3 percent, under estimates in May. It wasn’t a surprise that most of the shortfall — or $88.7 million — came from lower personal income tax revenue collections. Total tax revenues are $840.7 million below estimates. Like John Kasich, Sam Brownback was a onetime presidential candidate. Kansas Republicans delivered a punch in the gut to their governor by axing a centerpiece of his fiscally conservative doctrine. Ohio lawmakers are dominated by Republicans who have gone along with Kasich on a wide variety of issues since he first won the governor’s office in 2010. Not the least of those issues is reducing income tax rates, then compensating with hikes in other taxes, especially the sales tax, a well-known, decades-old regressive tax. Unlike Brownback, Kasich actually got clobbered in the race for president on the Republican ticket last year. Spending months on end out of Ohio on the campaign trail, then pushing his book based on his losing bid to move into the White House, has enabled Kasich to skirt his in-state responsibilities in major league fashion. A new balanced budget, a requirement of the state constitution, has a deadline looming at the end of June. So far, the Ohio House has only managed to fill the state’s widening budget gap with about three-quarters of the funds needed to bring it into balance. The remaining quarter was left to the Senate to fill. After five billion in income tax cuts, Ohio under Gov. Kasich has now endured 53 straight months of under performing the national job creation average, an accomplishment the governor ignores for good reason, since it blows up his mindset that cutting taxes creates jobs. 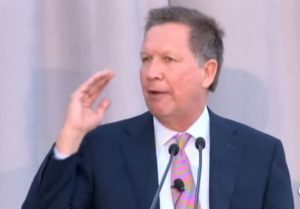 With the state on the verge of another recession, as Kasich has warned it is, Ohio lawmakers must have an appetite for more grim tidings, a stark contrast with Kansas where patience has worn thin on economic gobbledygook that fails to produce outcomes it believes in the most. Both Brownback and Kasich will leave office due to term limits by the end of next year. Unfortunately for Ohio, all Republican candidates running to replace Kasich hold the same views on cutting taxes, and it seems highly unlikely that Ohio lawmakers will become as frustrated as Kansas lawmakers are and do the right thing by refusing to reduce taxes even more, as Mr. Kasich again asked them to do. What’s the matter with Kansas is a question that should also be asked about Ohio, in light of the slow pace of job creation and a budget hole that shouldn’t be there had more responsible budgeting policies been pursued years ago, that would have pushed the Buckeye State forward out of a ditch not of its own making, instead of leaving it in a rut of its own making.